Going into Thursday night, I’d seen approximately 176 bands live this year. Give or take (this is based on my Flickr set which has one shot of each act, if you’re curious). Despite the volume, most of whom I’ve seen was at least sort of familiar to me either by reputation or by pre-show research. The point of this is that it’s fairly rare that I see a band without knowing at least something about them or with some idea of what to expect, and even rarer that one of the unknown quantities really manages to impress me. There’s a word for this – jaded. But even so, it can happen still that I’m taken completely off guard and totally floored by a band. Case in point, Thursday night and an outfit called Ryuichi. Hailing from right here in Toronto but unlike most acts, not seeming to share members with a dozen other bands or a side project of a side project. They may not even be within six degrees of Broken Social Scene – I can’t say for sure since the band’s MySpace uses nicknames and pseudonyms for the members and offers only a vague bio. But the tracks available to stream were promising if rather rough so I made a point of showing up at the Tiger Bar in time to catch their set. Good call. They were playing only their second gig but despite a few flubbed notes – the bassist was playing from crib notes – Ryuichi demonstrated a confidence, tightness and even some showmanship way beyond what you’d expect from a rookie act. And the songs, musn’t forget the songs. Take the restless creativity of To La Tengo and replace the jazz odysseys with danceable rhythms and a good dose of adrenaline and you’re in the ballpark. Their osund ran a gamut of styles from synth-pop, shoegaze and post-punk and distilled it into delectable power pop-sized servings garnished with melodic boy-girl vocals of a calibre that the MySpace recordings only hinted at. I can’t remember the last time I was so blindsidedly impressed by a band and am eagerly awaiting proper recordings and more shows. Their next gig (their fourth, if I’m counting right) is August 14 at the Reverb. So with that as a first course, Barrie’s Fox Jaws – the act I’d actually come to see – had a bit of a tough act to follow. I’d Sunday Cleaned their debut album Goodbye Doris last month and really enjoyed it so it was time to see if the live show – which I’d heard good things about elsewhere – measured up. Happily, they measured up just fine to the album if not the openers, but those “who the hell are these guys?” bonus points scored by Ryuichi would have been tough to make up. As on record, the centrepiece of the show was singer Carleigh Aikens’ wonderfully raw and expressive vocals with just the right balance of reined in and belted out. 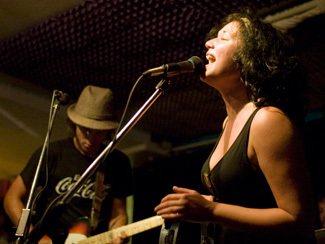 Co-vocalist Daniel Allen also did a fine job when called to step up and in harmony, but it’s Aikens’ presence that elevates Fox Jaws’ game and injects a healthy dose of soul to their rootsy indie rock, giving them a unique and distinctive angle. The intensity of the show took a hit when they lost several minutes trying to sort out a malfunctioning guitar amp but they got mostly back on track and turned in a solid performance. I mentioned in my initial review of the record that big things were inevitable – I stand by that but want to expand that sentiment out to include both bands I saw that night. I left before headliner One Heart Many Hands but hey – big things could be inevitable for them/him too. Three for three, why not? The Toronto Star talks to Tad Kubler of The Hold Steady, in town for a show at the Opera House tonight. Pitchfork finds out what’s going on with Cat Power these days, including news about her forthcoming The Covers Record 2, currently slated for a January 2008 release. BrooklynVegan has got Fall tour dates from Jens Lekman and while the gaps between October 29 and November 1 originally gave me hope that there’d be some local dates scheduled between Boston and Cleveland, the dates on Lekman’s website have him in Purchase, NY on the 30th. I suppose a Hallowe’en date is still feasible but I’m not so optimistic. This is the second or third time in the last couple years that Lekman has been in the area and skipped Hogtown. Why no love, Jens? But on the plus side, you can pre-order his forthcoming album Night Falls Over Kortadela from his Swedish label for $18 USD (including shipping) and not only receive a bonus CD but get it on the Swedish release date of September 5, rather than the North American one of October 9. Via Sixty Watt, via Mark. JamBase chats with Explosions In The Sky drummer Christopher Hratsky. They’re in town on September 9 playing V Fest. Some show announcements – Mark Olson will be playing an in-store at Soundscapes on August 28 starting at 6PM before heading off for his show at the El Mocambo that night. Marissa Nadler will be in town September 7 for an early PWYC show (7PM) at the Tranzac with with Picastro and Klaxons return October 10 for a show at the Opera House. Lee Hazlewood, RIP. More at Pitchfork. Thanks for the mention – the Jens Lekman post has been updated since you first saw it – Jens is making noise about having the bonus disc available outside Scandinavia…no firm details yet.